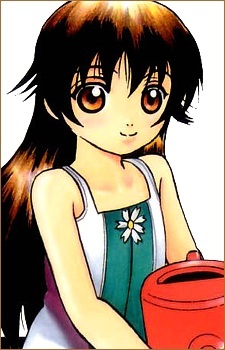 Tanimoto Kaede was the younger sister of Tanimoto Natsu, the ex-Six Fist of Ragnarok. Kaede and Natsu were orphans until they were adopted by a wealthy business man. Natsu worked hard to be the best heir his step-father could be for his sister, who was born with a deadly illness. When the step-father finally took Kaede to one of his medical facilities, he fell in love with the female doctor working there and married her. For a brief period, the family of four were happy, with even the step-father sincerely smiling. However, the peace was short-lived, as the step-father was found dead one morning, though the police were unable to confirm the cause. The police immediately suspected the step-mother as the culprit and took her away, leaving Natsu to run the company by himself. Sometime later, Natsu discovered that the step-mother never really treated Kaede's sickness and that her condition had worsened. While on her death bed, Kaede's final words were for her brother to never give in. Kaede's death and final words, along with his step-mother's possible deception and his rescuing from Hondo by Ogata Isshinsai, drastically altered and corrupted Natsu's innocent personality. This, along with his master Ma Sougetsu's training, made him into a cold hearted, ill-tempered individual. Later, when he meets Shirahama Honoka, he finds many similarities between her and his sister, and the two develop a very sibling-like relationship, though Honoka's clumsiness and childish nature frequently gets on his nerves. Kaede's last words also made him determined never to lose a single fight, which acted as motivation for him during his second fight with Honoka's brother, Kenichi and later in his death match with Chou Enshin.